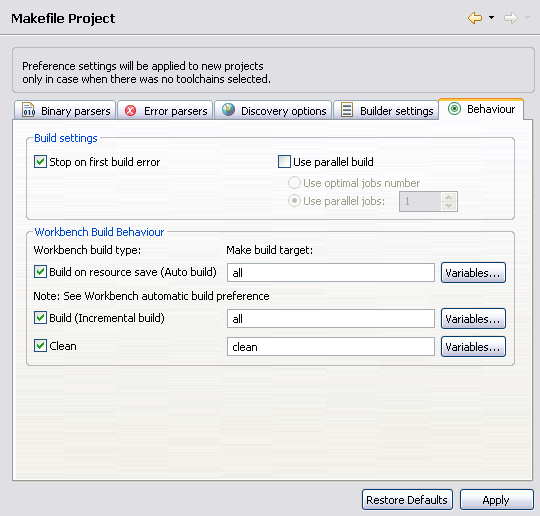 Use the Behavior page in the Makefile Projects preference panel to define build behavior. Stop on first build error Stops the build when an error occurs. Use parallel build Activate to generate parallel builds. Use optimal jobs number Activate to let the system determine the optimal number of parallel jobs to perform. Use parallel jobs Set the maximum number of parallel jobs to perform. Build on resource save (Auto build) Defines what the standard builder will call when a file is saved, it is not recommended to enable Auto Build for C/C++ projects. Make build target Define what the standard builder will call by default when told to build, rebuild, clean, etc. You can change these so that new projects will use different targets if the defaults are not appropriate. Click Variables to open the Select build variable dialog. Build (Incremental build) Defines what the standard builder will call when an incremental build is performed. Clean Defines what the standard builder will call when a clean is performed.